For drivers ultimately concerned with their fuel usage, the 2019 Toyota Prius can’t be beat. With class-leading fuel scores and a roomy cabin and cargo space that offers serious versatility, Toyota Prius drivers have everything they need to enjoy their time on the road with zero compromises. For the 2019 model year, the Toyota Prius received a handful of interior and exterior design updates that help keep everything fresh and modern. While the pricing and available trim levels didn’t change too much from the previous model year, the naming structure did. The Prius will now follow suit with other models in the Toyota lineup. The largest change for the new Prius is the addition of a brand-new AWD-e system that brings increased capability to the lineup. Keep reading to learn more about the new AWD-e system or check out the 2019 Toyota Prius models available at Serra Toyota in Birmingham, AL via the link below. The largest and most anticipated change to the 2019 Toyota Prius lineup comes in the form of a brand-new electric AWD system that allows drivers to have more confidence on the road when the weather gets tough or things get bumpy. The available AWD-e system will be available on the LE and XLE 2019 Prius configurations and is run by an electric rear motor in the rear of the vehicle. Keeping in line with its fuel-efficient roots, 2019 Prius models equipped with the AWD-e system will delivers some of the best fuel ratings of any AWD-equipped sedan in the market. Depending on driving conditions and habits, drivers can expect to receive about 52 miles per gallon in the city and 48 miles per gallon on the highway in 2019 Prius AWD-e models. Traditional front-wheel drive 2019 Prius models don’t disappoint on fuel economy either with an estimated fuel rating of up to 58 miles per gallon in the city and 53 miles per gallon on the highway for LE Eco grade models. Not bad for drivers who need to put a lot of miles under their wheels. 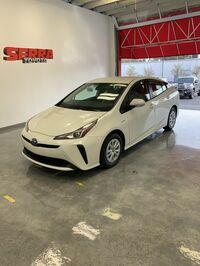 For more information on the 2019 Toyota Prius lineup or to set up a test drive appointment at Serra Toyota in Birmingham, interested parties can visit the dealership, give us a call at 205-847-1841, or connect online via the pop-up form below.